Easter, school holidays and lots of long Bank Holiday weekends to look forward to…not to mention a few late nights for all the family. Besides, how much harm could not brushing your teeth do? If that sounds familiar, you might want to think again. 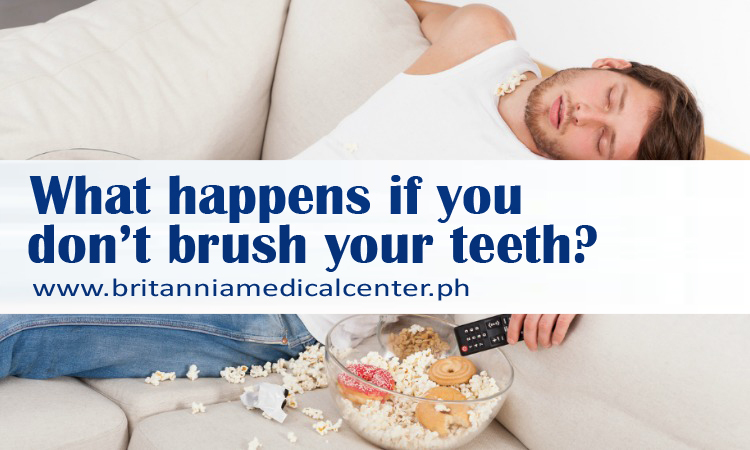 The bacteria in your mouth grows, taking its turn to have its own feast while you get some shut-eye – breeding on all you were eating last night and through the day. With no toothpaste or toothbrush to clear it away, plaque builds up, which in time can cause tooth decay. It also causes inflammation, which can lead to bleeding gums – a sign of gum disease – and eventually much worse: tooth loss. What’s more, your breath will smell. Pretty bad in fact! If we don’t brush twice a day, floss and use mouthwash or drink water regularly, we’re leaving bacteria there to multiply as it breaks down those foods and sugars left on our teeth. Of course that’s going to smell! But even if you think it’s just once and you’ll brush straight away in the morning – there’s another thing: your teeth have missed out on a key chance to repair themselves properly. Just as you need sleep to help your brain function and cells repair, your teeth also need regular doses of fluoride to help them remineralise – and the best time they can do this is through the night. Without fluoride toothpaste, they can’t do a proper job of healing themselves. Not to mention the long-term effects of not brushing. Over time, build-up of plaque has been linked to heart disease and strokes. Just one more reason to maintain a healthy mouth! While sometimes we can be caught short without a toothbrush, it’s always best to brush your teeth twice a day and change your toothbrush every 2-3 months. So if you’re considering skipping the brushing, do your mouth a favour and remember: it only takes 2 minutes – your bed will still be where you left it! Think your dental hygiene could do with some improvement? Why not book an appointment at Britannia - The Enclave. They’ll be able to give you top tips and check to make sure you’re brushing correctly.